So the other day my darling wife picked up some chicken breasts while she was shopping at her favorite place in the world, Target (or as we pronounce it, Tar-jay, everything sounds fancier with a French accent). Seriously, Target to her is what Disney World is to other people, the most magical place on Earth. I swear that she purposefully “forgets” things when she goes shopping just to have an excuse to go back! Anyway, I digress… She picked up chicken breasts. I took a quick look at my pantry and fridge (am I the only one that hears Ted Allen’s voice?) to see what I could come up with, and a few items in particular jumped out at me: eggs, lemons, white wine, butter. Wait a second, duh, francaise sauce! 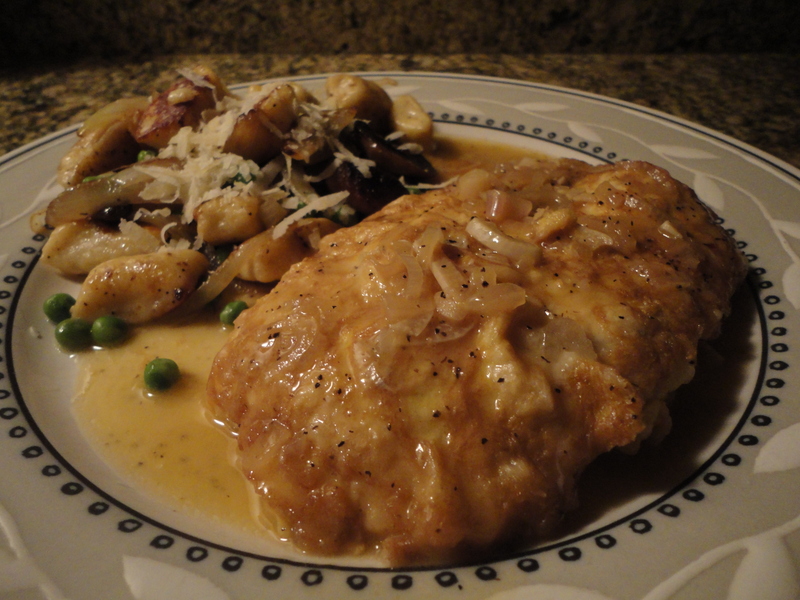 Chicken Francaise is simply chicken dredged in flour and eggs finished with a lemon, white wine and butter sauce. It sounds fancy, it tastes delicious, and it’s ridiculously easy to make. So here you have it. On the side I served some ricotta gnocchi with onion, mushrooms and peas, finished with shaved parmesan. If you’re interested in trying your hand at homemade ricotta gnocchi you can find my recipe here! Note: Making this for two people and making it for more than two are very different things. Sauté pans are only so big and there are only so many pieces of chicken you can fit in them. Since I’m guessing that most people reading this are looking to make dinner for more than two people I’ll write the recipe that way… The main difference is that if you’re just cooking for two you can make the chicken and sauce together in one pan, but if you’re making it for more you ultimately need to do them separately unless you have an insanely large pan, or are using the smallest chicken breasts I’ve ever seen. Again, I am assuming that your sauté pan can only handle two pounded chicken breast at a time, so you’ll have to cook your chicken in two batches if you’re making four. Ok so first thing’s first, you need to lightly pound your chicken breast to thin them out. Place the breasts between two pieces of plastic wrap, and using either the flat side of a kitchen mallet, or a rolling pin, lightly pound them out until you have a uniform thickness of roughly 1/2″. Heat the olive oil in a large sauté pan at medium-high. Thoroughly coat the chicken with flour and then dredge them in egg, quickly get them into the hot oil so too much egg doesn’t run off. Cook until lightly browned, about 3 minutes, then carefully flip and repeat. I recommend using a fork to handle the chicken. The egg batter falls off very easily and if you use tongs there is a good chance of ripping it. Once both sides are browned set the chicken on a lightly greased baking sheet and allow to rest at room temperature. You’re going to use the same pan for making your sauce so don’t dump out the oil. Reduce the heat to medium and add the shallot and garlic, along with 1/2tsp of salt. Sauté until they start to sweat (this simply means that they begin to release their natural oils, which in turn will mean more flavor for the sauce), about 3-4 minutes. Increase the heat to high and add your white wine and cook until it’s reduced by half. Add the chicken stock and juice from the two lemons (careful not to get seeds in the sauce), as well as two squeezed lemon halves (make sure there are no stickers on there! ), bring to a boil then reduce the heat to medium-low and simmer for 10 minutes. Put your chicken in the oven at the beginning of that simmer time. After 10 minutes remove the lemon halves, add 1tsp each of salt and pepper, as well as the butter, and cook for an additional 5 minutes, stirring periodically. The sauce and the chicken will be done at the same time. Remove the breasts from the oven and plate them up, then ladle the sauce over the top. Serve it with your side of choice and enjoy! I’m always a fan of either doing gnocchi, as I mentioned above, or roasted potatoes and asparagus. If you decide to do asparagus you can just cook them in the sauce for 2-3 minutes while it simmers (after having added the butter). How easy is that!? Now let’s talk wine pairings… We’re going straight up white wine here, there aren’t too many reds that will play nicely with the overt lemon in the sauce. I recommend going in one of two directions. Either something acidic to pair with the lemon and cut through the richness of the butter, OR, a fuller bodied white that plays well with the butter and helps offset the acidity of the lemon. So it really depends if you want the overall experience of food and wine to be crisp and acidic, or rich buttery goodness. Here are a few possibilities. So there you have it. My recipe for a timeless classic, and the wines that I would recommend with it. Hopefully you enjoyed the read, will try the recipe and the wines. As always, new content is coming soon. In the meantime crack open a nice little citrus driven white, sit back, and relax. Life is short, enjoy it!